» Locations - Google Maps integration, AJAX auto-completion, get directions, URL, HTML descriptions, photo gallery. » Recurring events at the click of a button - choose repetition cycle (days, weeks, months, years), end date, repetition days and more. » Attach files to your event - your visitors can easily download them (eg. flyers, presentations, archives etc). » Allow users to add their own events in the frontend. » Increase your website's traffic - SEO semantic events, tags & multiple categories. » Social sharing - allow people to rate the event, like it on Facebook, share it on Twitter, Google+ and LinkedIn. » Groups - fine tune the permissions of your visitors by using the Groups option. » Seating Chart - show a visual representation of the seats available through the configurable Seating Charts option. » 12-hour date format as well as 24-hour format support! » RSForm! Pro - Create your custom event subscription / registration form with our popular form builder. » RSMail! 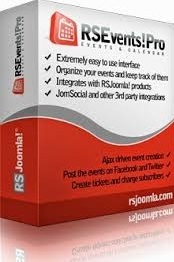 - Show events inside your newsletter with the click of a button. » RSMediaGallery! - Use the friendly interface of our gallery management extension to manage your event's gallery. » Content - Show your event in an article by using the Content Plugin. » Payment Plugins - Offline Payment available by default. Others are purchased separately (2Checkout, ANZ eGate, Authorize.net, eWAY, iDEAL, MyGate, PayPal, Virtual Merchant). » PDF Plugin - Create PDF files (with barcodes) that your subscribers can print!